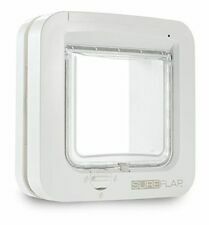 SureFlap SUR001 Microchip Cat Door - White. Dispatched with Royal Mail 2nd Class. 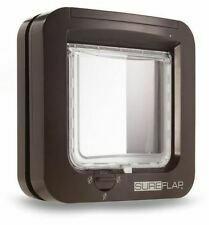 SureFlap (SUR001BR) Microchip Cat Flap - Brown. Dispatched with Royal Mail 2nd Class. • Works as a standard Microchip Cat Flap if no Hub is connected. A Hub can be added at a later date to enable connectivity to the internet and Sure Petcare app. • Stay up to date and receive a notification when your cat goes in or out via the cat flap. The SureFlap Microchip Pet Door Connect with Hub is a larger size pet door that is designed for small dogs and larger breeds of cat. Stay connected and give your pet freedom and security with a Microchip pet door. The microchip cat flap can also be installed in glass from 3mm to 6cm in thickness. A mounting adaptor is required for glass and wall installations. Selective entry – any animal can exit. The microchip reader is located on the outside of the cat flap only. You have a statutory right to a cooling offperiod. Any characteristics of the Goods which may cause them to deteriorate or expire rapidly;. Factors which may be taken into account in the exercise of this discretion include, but are not limited to. GENUINE Sureflap Microchip Petdoor Large Catflap Small Dog Big Cats WHITE. 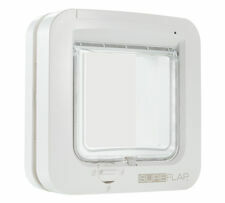 Large Cat - Sureflap Microchip Cat Flap. Compatible with all microchip formats worldwide. Suitable for multi-pet households (up to 32 pet identities). Easy to install in doors, windows and walls, while 4 x C Cell batteries should keep it powered for up to a year. Available in 2 colours. Can be installed in doors, windows or walls - accessories available. 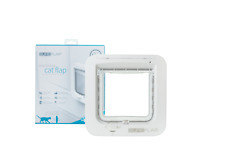 The SureFlap DualScan Cat Flap from Sure Petcare is compatible with all common microchip types and will work with your pet's existing microchip. It is ideal for multi-pet households as it allows you to set different rules for each pet, stopping pets which must stay indoors from going outside, whilst allowing others to exit. 1 x Microchip Cat Flap. Selective entry but allows any animal to exit. The microchip reader is located on the outside of the cat flap only. The cat flap is battery powered and requires 4 x AA batteries (not included) which will last up to 12 months with normal use. You have a statutory right to a cooling offperiod. Such discretion to be exercised only within the confines of the law. Easy to install in doors, windows and walls, while 4 x AA batteries should keep it powered for up to a year. 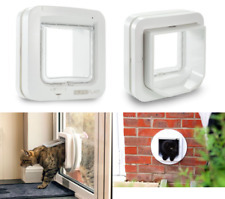 The SureFlap Microchip Cat Flap identifies your cat by using its existing unique identification microchip, unlocking only for your cat and leaving the neighbour's cat at the door. The 4-way manual lock enables locking to any combination of in/out. SureFlap from Sure Petcare is a revolutionary, battery-powered cat flap which reads your cat's existing identification microchip, only unlocking for them. There is a simple one button learn process that you perform once for each of your pets. It was developed by a scientist (and cat!). It will grant entry through recognising your cat’s microchip that has been implanted by the vet. 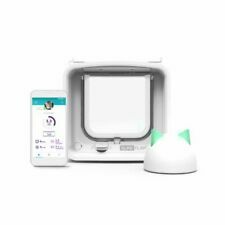 It cleverly learns the microchip with a simple one button programming and will let your cat and only your cat through the flap. 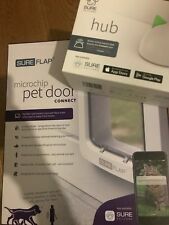 Sureflap Microchip Petdoor Connect Bundle .